Being that nature came to me this time, I felt it only right to spend some time contemplating the fine details of Basswood seed distribution. Basswoods are common mid-western trees known for producing fine carving wood and “bast” – or twine – rendered from the bark. They are also known as “honey trees” for the honey produced by bees feeding on their nectar-rich flowers. These flowers bloom in June and eventually turn into the unique seed structures shown above. The flower/seed unit consists of a woody stem suspended from the center line of a modified leaf called a bract. Like the winged seeds of the maples and ashes, the Basswood cluster is made to take flight upon being released. The structure (see below) bears an uncanny resemblance to one of those old-fashioned whirligig flying toys – you know, the kind that inspired the Wright Brothers to break the bonds of gravity. Unfortunately, this uni-wing only propels the falling seed bunch a few tree lengths away under the best of fall wind conditions and straight down when no wind is present. Ahh, but the Basswood has another trick under its woody sleeve to overcome this fault. They don’t release most of their seed structures until winter arrives. They wait until winter levels everything first. Tiny, but tenacious, tendrils hold the stem onto the branch until winter gales force them to finally relent. Taking advantage of crusted snow and high velocity winds, the structure sails along over the open surface like an ice boat over a glassy frozen lake. In other words, the initial flight sends the seeds a short distance from the tree and the skidding experience keeps it going, and going, and going like the Energizer Bunny. 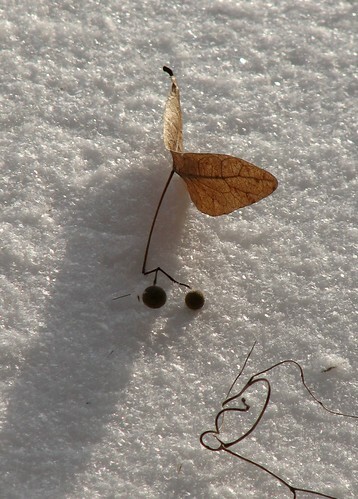 One by one, the tough encapsulated seeds fall off and settle down through the melting snow to the spot they will call home for the next 100 years if they are lucky enough to sprout. This snow sliding technique is all but ignored in modern literature – the wing function rather than the sail function, is emphasized. I consulted one of the old texts to find a description which adequately explained this winter dispersal method. Some 110 years after Dr. Beal revealed it, this unique little piece of natural history news announced itself at my own back door. “It looks like there’s no letting up” when it comes to uncovering nature’s wonders. There is a constant battle for life going on out there beyond our doorsteps. I am referring to the interplay of natural players. We only rarely see the interaction of predator and prey, and often that is reduced to a fleeting view of the chase. More often than not, we are not there to view the exact circumstances of death or experience the thrill of the final escape. When we are witness to a “kill,” it becomes a rare and singular experience. Because of this we tend to view violent death as a rare thing in nature. Nothing could be further from the truth. Death, raw and definite, is an essential part of the natural scheme – as common as the passing of a cloud and as regular as the flow of water down a stream. 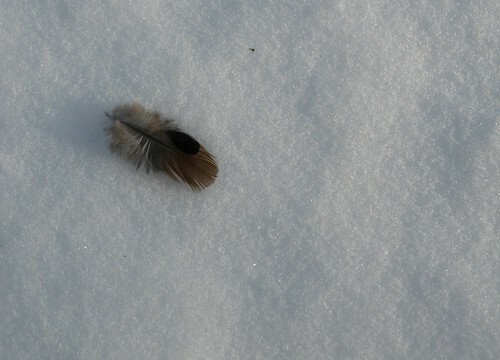 I was not witness to the common death of a Mourning Dove in my own backyard but, thanks to the snow track record, I can testify as to some of the particulars. In viewing the scene (see below). I believe the victim was attacked while in the air and brought to earth. A few drops of rich red blood surrounded by a halo of feathers and wing marks (see detail here) indicates where the bird was dispatched and a series of scooping wing beats (see detail here) reveal where the killer struggled to get airborne with her hefty meal. The scattered feathers, like the single contour feather shown above, are enough to identify the victim as a Mourning Dove. These birds are common features of the winter landscape. They gather into small winter flocks and are frequent visitors to neighborhood bird feeders. I don’t have a feeder (surprising, you may think, for a naturalist but I’ve got my reasons) but I do have plenty of large spruce trees and a small stream for cover and water. On any given day, therefore, there are plenty of doves around. This also implies that my yard is a regular hangout for bird predators who stop in to scope out the joint, so to speak. The predator in this case was probably a female Cooper’s Hawk. Cooper’s are “bird hawks” who specialize in avian prey. The females are larger than the males and they have more “umph” in their hit. This means that they can take down larger birds. A female Cooper’s weighs in a over a pound, whereas their male counterparts are closer to 12-13 ounces. Mourning Doves weigh only about 5 ounces, but are relatively large when you consider their wingspan and lengthy tail. My statement that the killer was probably a female is also based on more than gender supposition, my dear Watson. 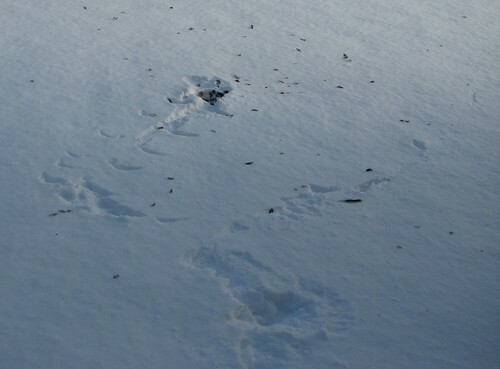 There is a perfect spread eagle…er, spread hawk…er, snow angel imprint right next to this kill site (see here). I’m thinking that the hawk could have missed as part of an earlier attempt on a different bird and plunged into the snow as a result. The wingspan indicated by this mark is clearly in the female Cooper’s range. There is a more obscure repetition of this spread eagle, or whatever you want to call it, pattern surrounding the actual kill location and the wingspan measurements are about the same at both spots. I can also theorize that Col. Mustard was hiding within the cover of nearby spruce tree boughs and that he, or she, launched several attempts from that location before achieving success. She returned to the base of that very tree to finish off her meal (see here). Dove feathers were scattered all about the kill site. Accipiters, such as the Cooper’s, pluck their prey before eating it. It is a point of professional pride among them I guess. This evidence alone would have identified both the type of perpetrator and the exact identity of the “perputee” in a snowless landscape. As it was here, we have a sort of surveillance tape record of the event starkly recorded in the snow. It is important to keep in mind that this situation, in spite of my inexpert use of police terminology, was not a crime. It was merely a chance record of real life. As evidence that opossums can push the envelope every now and then, I present this picture. It would be inaccurate to say that this individual was speeding, but it was “moving rapidly forward.” It guess you could say it was trotting. The blur factor gives the image a NASCAR type look. The fleeing beast was dashing for the finish line, and the cover of the brush line, just as the picture was snapped. 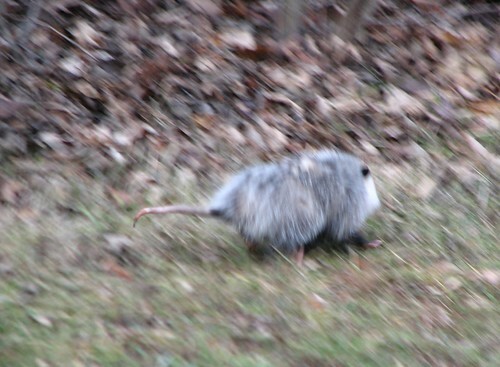 This speedster was the second such opossum that I encountered in so many weeks. Last week, another one crossed the road in front of me (yes, they actually can successfully cross the road on occasion) and did so at a brisk pace. Watching that one, and the one pictured above, I have gained a new respect for ‘possum trotting skills. These animals, plantigrade or flat-footed walkers that they are, engage in a determined form of speed walking. Head down and tail held straight out, they burn up ground at the rate of approximately 4.5 mph. All of this got me to wondering what you should call this style of movement. It certainly isn’t running and I’m not sure trotting is the correct term. Several southern states have a town named Possum Trot, but that doesn’t make it right. So, I hit the references and Internet for answers and came up with the usual mix of tripe and truth. For instance, one site claims that 8.3 million opossums are killed on our roads every year – in essence proving the claim that they can’t run and are born dead on the road! Another one classifies them as rodents and puts them in the company of “mice, rats, and raccoons.” They are marsupials, by the way, and raccoons are in the weasel family. I also found out that there is actually an organisation called the Opossum Society of North America. I wonder if they have 8 million members? Anyway, one site did put out the 4.5 mph figure based on a reference from McManus (1970), but didn’t commit to the running question. So, there you have it. Opossums, like elephants, are Groucho Runners. That may be “the most ridiculous thing you ever hoid,” but it is documented science. One thing I’ve noticed, and no doubt you have also, is that there are an incredible number of dead Fox Squirrels on the road lately. Squirrels certainly cannot be considered as brilliant when it comes to road-crossing abilities – after all, most are top graduates from the Opossum School of Roadside Ambulation (OSRA). A dead squirrel on the road is as natural as the center line itself. But, I would have to say that they are currently outdoing their marsupial teachers as pavement pancakes. Some would say this phenomenon is due to a population explosion brought about by global warming. Polar Bears, forced by rising waters to take to the mainland, have started to munch down on the squirrels natural predators. The squirrels have reacted to this new found freedom by making lots and lots of baby squirrels. Unleashed onto the world in prodigious numbers, the poor little things are being slaughtered by our senseless automobiles. The only way to stop this is to buy more Granola. Well, there are several things wrong with this theory – not the least of which is that vehicular homicide is the chief cause of death among Fox Squirrels. Cars could therefore be considered as their chief predator. Polar bears have yet to be seen rampaging through car lots or destroying auto dealerships. I have a better theory based on facts. 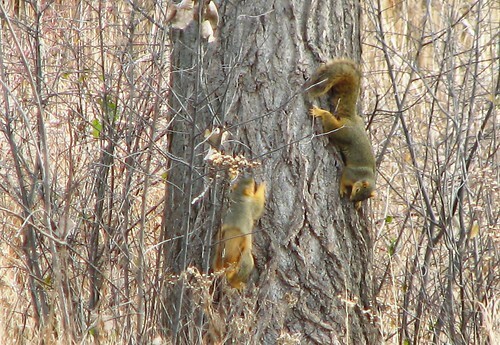 This is Fox Squirrel mating season. Squirrels are becoming hot-blooded because of raging hormones and not due to a perceived global rise in temperature. Stupefied by lust, males charge randomly (more random than usual) across yards, woodlots, and roads while seeking dates. They don’t stop to think. My reference to increasing numbers of non-thinking squirrels who end up with “X’s” in their eyes refers only to a short term, but annular, phenomenon. By “lately,” I mean within the last few months. The same thing happened last year at this time. Life has a way of repeating itself. Life has a way of repeating itself. It is odd that Fox Squirrels choose this time of year to “do it.” Beginning in December, the winter breeding cycle peaks in mid-January and dies down by February. In truth, they have two mating seasons per year. The other period runs from May to June. The spring season makes more sense as a time to get frisky, but squirrels have no need for sense. Apart from the rise in road kill levels, you’ll notice a lot of running about as an indicator of this winter love season. Several males will attempt to woo a single female. One guy will lay claim to his queen and dutifully chase off any rival princes. He will also chase his queen around until she relents to his advances. The overall result of all these shenanigans is that there are squirrels darting all over the place like animated mice. No one is sure who is chasing whom and for what reason. About the time they do figure things out, they are in the middle of the road and…well, you know what happens. One primary feature of a squirrel love chase is the “round and round the tree we go” routine (see here). Two lovers, haters, or whatevers, will spiral around a trunk. Often one will suddenly stop and confront its pursuer. When this happens, they will spend a brief period of time signaling each other with wildly flipping tails. Oddly enough, one of the typical tail poses consists of a question mark as if to say “what gives?” (see here). It so happens that visible talk is a key component of the winter mating rite. When it comes down to it, squirrels are only as good as their tails. The very Genus name of the group, Sciurus, means “shadow tail” in Greek. They also use their sizable appendages (see here) as umbrellas and gyroscopes, but right now they are functioning as semaphore flags. It is too bad that they can’t figure out how to use them as traffic signals as well. I’ve always thought that winter Sycamore trees look like they are decorated for the Christmas season. These mosaic barked trees are currently adorned with festive arrangements of ornamental spheres dangling from long cords. Although this decor may be nothing more than a practical display of seeds, these displays present a Martha Stewart-like sense of holiday style. Even the bark has “that certain something” about it. Perhaps I should back up a bit and introduce the Sycamore before I go any further. These stately trees stand out clearly against the naked gray backdrop of leafless trees (see here) which makes cold season identification relatively easy. The upper branches and trunk are smooth and nearly white – unlike any other tree in the surrounding woods. Further down on the trunk the bark breaks up into a random patchwork of greens, creams, and browns (see here) and settles into a even rough brown at the base. A good memory tool for remembering this tree is to think of the flaking bark as making it look “sick.” A lot of flaking bark makes it look “sick-a-more.” Get it? To find one in the wild you’ll need to be standing pretty close to a riverbank, which is a circuitous way to say that they prefer growing in riverine habitats. Another important Sycamore feature is the fact that they get quite big and are frequently the largest tree in sight. In the “old days”, early pioneers would record sightings of massive trees towering well over 150 feet in height and having trunks up to 13 feet or more in diameter. One hollow trunk was once used as the structure for a travelling saloon on wheels. Most of these monster trees are long gone, but there are quite a few hefty examples in Monroe County and elsewhere in lower Michigan. I recently read that the world’s largest tree stump happens to be from a Sycamore and can be found in Kokomo, Indiana. The hollow stump is 57 feet in circumference and is now encased within a protective shelter. It once housed a telephone booth and, according to the web site, could accommodate 13 people (all waiting for the phone I presume). While you are there, by the way, you can pay a visit to “Old Ben” – the world’s largest preserved steer – who is housed nearby. But, I digress. The detail of this present discussion are those interesting looking seed balls that hang from the branches. Alternate names, such as Buttonwood and Buttonball Tree, are very descriptive of this trait. Seen up close (see here and here), these structures are revealed to be spiny balls connected to the twig via a tough, flexible stalk. 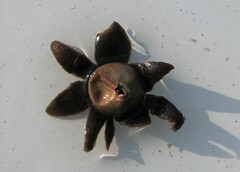 Hundreds of slender seeds are attached at the center to a small interior sphere about the size of a cherry pit. 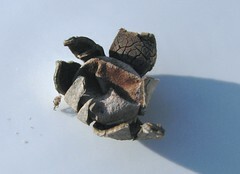 Each individual seed is encapsulated within a hard casing like a sunflower seed. This type of seed is called an achene among the botanically elite in case you wanted to know (they may ask you this when you go to Kokomo). Eventually the seeds slough off and fall to the ground, leaving the weathered little mini-balls to tough out the rest of the season. There is one more Sycamore detail worth relating. The buds of this species are unique in that they develop within, and are completely surrounded by, the base of the leaf during the growing season. 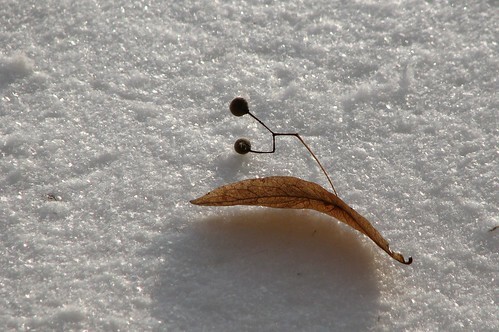 When the leaf falls off, the exposed winter bud is completely surrounded by the leaf scar (see here). Most plants have a leaf scar located under the bud. I will admit this fact can not match up with Kokomo’s claim to being the first place where fins were put on aerial bombs. But, considering that sycamores have been around for 100 million years, anything they do is worth paying attention to. 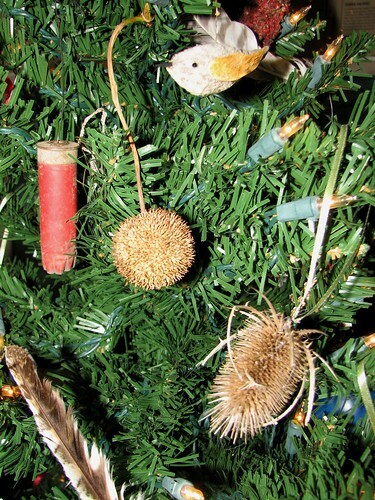 I did put one of these seed balls on a Christmas Tree as a way of putting my earlier statement to the test (see above). It makes an artificial tree look a little less artificial, don’t you think? Also, another nice thing about a Sycamore ornament is that it will fall apart after the holiday season is over. This eliminates the storage problem. � Yes, it’s snowing now – get over it. It snows every year. Sometimes it’s early, sometimes it’s late, but it is as it is and that’s it. At least this means that we can start talking animal tracks again. That is a good thing. I like to talk about winter tracks, so it’s good for me at least. Now normally I don’t spend too much time on bird tracks other than turkey, pheasant, grouse and the big guys.� Little birds don’t land that often and they leave little tracks that look pretty much alike when they do.� They are not exactly alike, of course, but it is exceedingly difficult to differentiate a Tree Sparrow trail from a Junco’s jaunt. There is the matter of pattern to help us out, however. � Earth-trekking birds, I’m talking perching birds here, �fall into two basic patterns when it comes to preambulating. There are walkers and there are hoppers. Walkers put one foot in front of the other and hoppers keep their feet side by side and perform a series of short bunny hops (a cross-species term which I’m sure some birds would find offensive if they could read).� These habits are clearly reflected in the avian track record. � In considering this fact, I am forced to draw a parallel with learning human dance steps. One way to learn a new dance is to follow the footprint diagrams from a book. I don’t dance*, but I know this is true. I view a dance floor the way some people look at a snowy pavement. I see an open floor in front of a band or a DJ as something dangerous. As Jerome Kern (actually I think it was Oscar Hammerstein) said it: “I won’t dance, don’t ask me. I won’t dance don’t ask me. I won’t dance madam with you. My heart won’t let my feet do things that they should do.”� But my point here is that in learning bird steps you can think in dance terms. �For instance, Mourning Doves are walkers. Being pigeons, they also happen to be pigeon-toed so they walk in a line as shown in the photo above. In the proper tracking conditions, every wrinkle on every little toe shows up clearly. When performing the Dove step, the birds also happen to pump their head back and forth like a metronome. If you want to look dangerously foolish on the dance floor you can try out the Dove Step. No one will laugh because everyone looks dangerously foolish on a dance floor. �When the Tennessee Bird walk begins to play, you can switch over to the Cardinal step. Cardinals are hoppers. 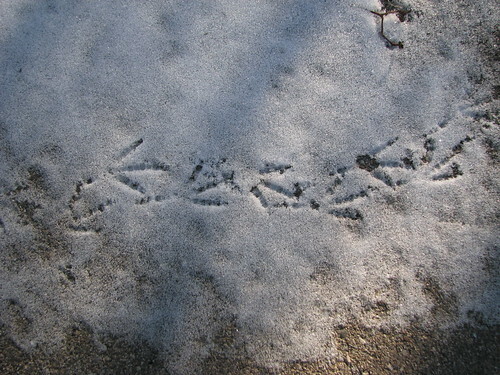 In the dance book, and in nature, their tracks look like this (see here). Again, the pattern is distinctive and the especially long back toenails often leave a long drag mark. �Cardinal tracks aren’t red (although they can be read) and Mourning Dove tracks aren’t especially sad looking, so exact identification beyond�pattern is still hard. �I must admit that I was able to identify these tracks because I saw the dancers. I guess that is how it works – first you observe the dance and then you record it so that others can appreciate it.�� Crows and blackbirds are, like the dove, walkers. Most wee birds, such as Juncos, chickadees, sparrows, and finches are hoppers. � Some, such as the robin, do a little of both. They intersperse bouts of quick walking in-between hopping. If I were to do a bird dance, that would be my chosen style. Yes, quick walking toward the door followed by a hop into the car when the music starts. *NOTE: I will take exception when slow dances are requested by my wife, but this is only after repeated� pleas. � It was early Friday morning when I ventured out to my back shed to get a reindeer antler. The morning was bright but the temperature was a crisp January-like 18 degrees. I unlocked the shed door, swung it open, and spied two large bugs�hanging along the inner edge (see here and above). Although you, the reader, might rightly figure that�I am about to tell you more about these bugs, you probably are still a bit puzzled over the first sentence. � Retrieving Rudolph’s antler from the shed sounds more like a passage from Santa’s diary than a clownish naturalist’s blog. I do believe the Jolly elf does take along some spares just in case one of his reindeer blows an antler along the way – I mean, how embarrassing would it be to have a flat antler over Finland with no service stations open? My shed-ward excursion was to get an antler for presentation purposes. � Now that this explanation is out of the way, let’s get back to the freezer bugs.� These creatures are called Leaf-footed Bugs, a name that needs no explanation once you see them close up (see here – note crab spider snuggling up). You’ll note that there is a leaf-like expansion on each of the back legs. In insect talk, this portion of the leg is called the hind tibiae. One reference even refers to this feature as a “foliaceous hind tibia” which makes the thing sound very grand indeed. 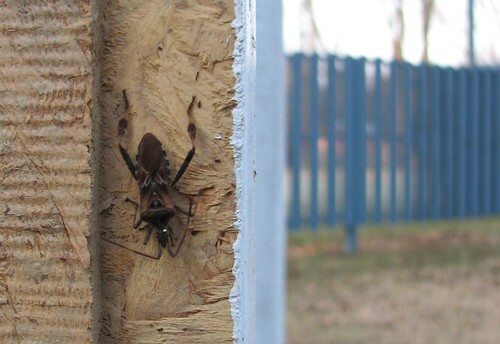 As “true bugs,” these�foliacious fellows are sap-suckers by trade and are related to Stink and Shield bugs. If irritated, they can flood the air with clouds of “straight chain aldehydes and keytones” – in other words: defensive stink bombs. � These individuals are overwintering, or hibernating if you prefer (technically not true, but let’s not get our antlers out of whack here). �The season for active stinky�plant juice drinking�insects is over and adult female Leaf-footed Bugs seek shelter and enter into a state of deep torpor in the cold season. Charged with an ample dose of natural anti-freeze, they can sit out the coldest of weather.� They look dead when in this state but remain flexible.� If the temperature were a bit warmer, the bugs would have been able to render a weak response to my intrusion. Instead, they could be handled without prompting a release of�the s-bomb. � I needed to do a little homework in order to find out the exact species.�Inverted white V markings on the back, actually looking more like a�pair of conjoined lower case “h” letters, identify them as an introduced species commonly called the Conifer Seed�Bug. I have several large spruce and pine trees in my yard, so this makes sense. When in large numbers, these insects�can be a substantial pest, so�I would be in my rights to end their kryogenic little lives with a single step (leaf-foots are also called squash bugs, so there would be some poetic justice here). But, such is not my way.� Nature, it turns out, already�has a control plan in process. � Take a close look at this one (see here).�Can you see that tiny white seed on this gal’s head? That is an egg laid by a parasitic�insect called a Tachinid Fly. The fly larvae has already hatched, burrowed into the bug’s body via the head, and consumed a large part of the innards. The leaf-footed bug was already running on empty by the time it entered winter shelter and the fly larvae is overwintering with it – snug as a bug in a bug! It will emerge out of the hollow shell of its host and pupate when spring comes along. � In fact, given that the type of Tachinid Fly is apparently called a Feather-legged Fly, there certainly is some poetic language justice in this situation. It takes a hyphenated killer to take on a hyphenated pest. �My wife often accuses me of having only three jokes in my act. I think I actually have four, but that is beside the point. One of my favorite gags is to point out to a nature walk audience that you never see just one Common Tern. Why? they ask – expecting some pontifical answer. I answer that it is a well known fact that “one good tern deserves another.”� If, after the groans die down, we spot a solitary tern in the distance I quickly point out that the individual must be one of those bad birds – you know, the kind that have taken a tern for the worse. � A classic example to illustrate this concept is the Chickadee (see above), that black�& white little dynamo of the winter woods.� You rarely just see one Chickadee. About the time you hear one (like this one: Chickadee Call) and locate him dangling precariously from some branch, you’ll spot another one and then a third�and… It doesn’t end there. Pretty soon you’ll also see a few Downy Woodpeckers (see here), a Cardinal or two,�and possibly a Brown Creeper close by. Yellow-rumped Warblers and even Tree Sparrows may put in an appearance.�In short, one Chickadee sighting nearly always translates into a band of assorted peeps. �I was in the midst of just such a gathering yesterday. Beginning with a silent wood, a gathering of three or four tweeting chickadees began to fill the air and flit about me.�A pair of cautious�cardinals then joined into the fray�as�did�a limb-tapping Downy Woodpecker.�I managed to record some of this mingling of avian talents (listen here) before the whole troop moved deeper into the thicket and left me, once again, in silence. � No, I don’t have a pun to go along with this�phenomenon because my other two jokes happen to be about beer and geese. It would be a cardinal sin to�attempt one anyway. I do have a legitimate explanation for these Chicka-gatherings,however. Small winter birds tend to forage together for the sake of mutual safety. As an assemblage of alert eyes, the gang can alert each other to the presence of a Cooper’s Hawk before things take a tern for the worse. The whole thing is mutually beneficial for all but is somewhat unintentional. Each bird watches out for itself, so it is not a true colonial thing, but they all seem to like being in each others company. 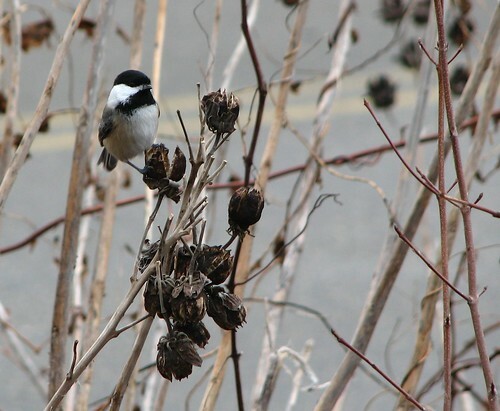 Chickadees can be considered as the glue around which these wandering feeding flocks congregate. �I know what you are thinking. “Birds of a feather flock together,” right? Here we have a band of brothers pulling together for the common good.�Well, there is another way to look at this – simply stated as “the more the merrier.”� Flocking increases the chance that your neighbor will be eaten before you are. All the birds are thinking�this but they have the decency not to bring it up- otherwise things would “tern” ugly. The Earth Star (see above) is a fungus but not a lowly one.� It can literally raise itself above the pack and move about in the manner of greater life forms. I recently encountered a constellation of these unique�puffball relatives in a patch�of barren sandy earth�near Grand Rapids, Michigan (see here).�I “captured” a few and brought them home in order to conduct a little…er, test of their motive skills. � I am hesitant to say that�I experimented with them.� That sounds way too much like the plot of an old science fiction film. I would be the aging scientist with a beard and spectacles who allows “something to go horribly wrong” after the�radiation test. The irradiated fungi would grow into humanity-shredding monsters and knock over toy villages – spewing death�spores over the innocents.�I,�the bespectacled aging scientist, would be left saying “What have I done. What have�I done?” No, my test would involve nothing more than water and willing subjects. � To our eyes these earth bound stars appear fixed into their�position and for our immediate purposes this is just fine. One doesn’t need to sneak up on earth stars or view�them though a telescope. This late in the season they are nearly as worn out as the beleaguered soil upon which they grow. But even in their cracked and weathered state, it is easy to see why they are called what they are. A central mini puffball is surrounded by a stellar arrangement of leathery “petals”� which gives them an otherworldly look. � They begin their life like most fungi as a mass of mycelium in the dirt. This type, called the Barometer Earthstar, prefers to spread its fibers in thin soils where there is little competition. 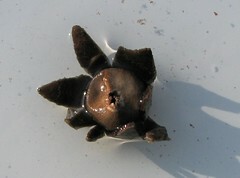 A small round, and multi-layered, fruiting body is formed and pushed up above the surface. Eventually the outer few layers peel back to expose a thin-walled puffball with a central opening (in the movie this would probably be the mouth!). All that remains is for falling raindrops to punch away at the exposed papery ball to release puffs of spores. This is where the thing gets interesting. � Earthstars are not content with just sitting there in a state of blind mindless hopelessness for rain. They, in their blind mindlessness, actually seek to raise their puffball up into the lofty atmosphere. The “petals” absorb atmospheric water, or directly soak up the liquid element, and by so doing are compelled to curl even further back. This action propels the star’s punching ball center into the heavens where air currents can carry away the spore clouds. True, “lofty” in this case is only about a 1/4 inch off the ground, but this is enough to change the influence of air currents. 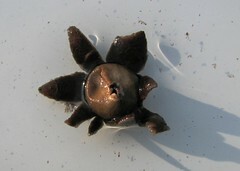 When conditions dry up, the petals are pulled back into a shielding position. 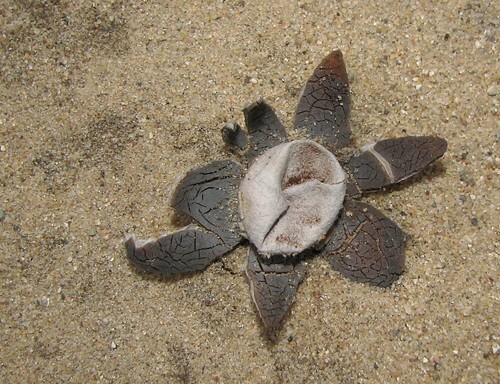 I leave you to consider the amazing earth star. Oh no, what have I done?